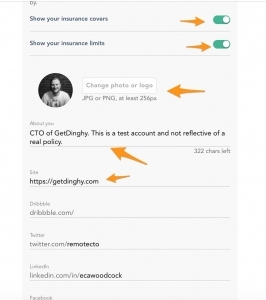 Back in July of this year, we announced the launch of our proof-of-policy pages, which is a fantastic tool to prove to your clients in realtime that your business is insured. But did you know that this page also functions as a referral page from which can earn you vouchers to spend either at Amazon* or John Lewis / Waitrose†? This can be a great way to help out a little with the monthly food shop or some gift shopping you might need to do or maybe even just to treat yourself. Did you know? 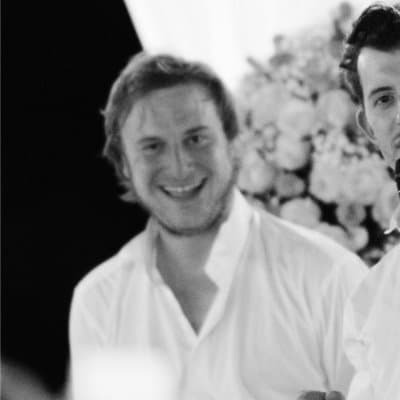 Between them, our customers have already generated thousands of pounds worth of vouchers for themselves and their friends. 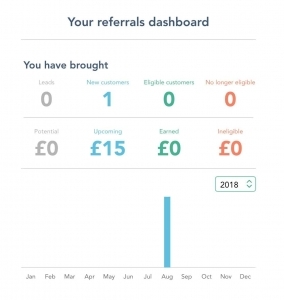 Our referral scheme works by issuing both you and a new customer you refer with £15 each for every referral. Vouchers are released once the new customer has successfully paid their third monthly bill. So for example, if a new customer buys their policy in mid-October; their first monthly payment shall be 3rd November and their second on 3rd December. Then on the 3rd of January, their third payment shall be taken, unlocking the voucher for both you and the customer at which point it will be sent out to both of you. 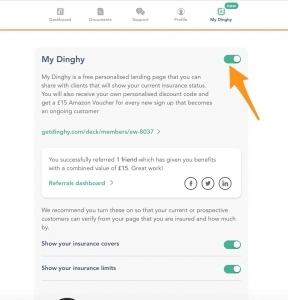 It’s really that simple, so as long as a new customer buys their policy via the ‘Get Quote’ button on your referral page and successfully pays their third monthly bill, then the vouchers are yours! So here’s a quick guide on how to set up your referral page and start earning your vouchers. 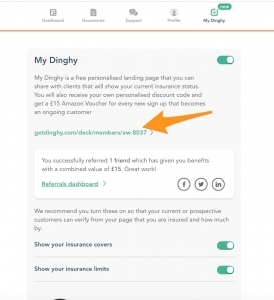 When you first buy your policy with Dinghy, by default your personal page is disabled, so you will need to explicitly enable it and then customise your page as you wish. You can do this by logging into your self-service area. Simply visit the sign in page, enter your email and then wait for your magic-link email which will then take you straight into your self-service area. Once in your self-service area, navigate to the ‘My Dinghy’ tab, and then switch the toggle on. 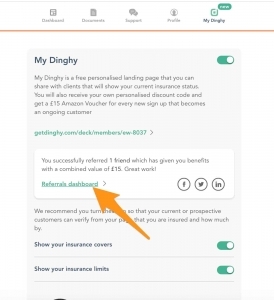 With this on, you now have a default referral page enabled, and you will see a link to your own referral page if you wish to preview it. 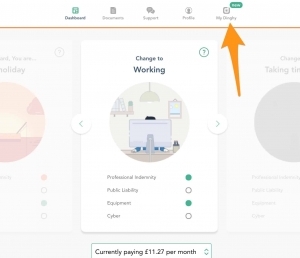 With the toggle on, this whole section of your self-service are allows you to customise your own page. These referral pages are discoverable via Google search results, so this is an excellent opportunity to promote your business and services. You’re advised to add as much detail as you can, including a profile image or logo, an ‘About you’ to describe your business and various links including to your personal or business website. Posting a link on their own website (this also works well with the Dinghy badge). Sharing with friends and family who are freelance. Sharing with past and present freelance co-workers. Sharing with their clients who work with other freelancers. Posting on their social media feeds. ** Do check first that the terms of the forum permit this. Leads. These are people who have got a quote via your referral page but not yet bought. If these are people that you know it can often help to give them a little reminder. New customers. These are people who successfully bought a policy via your page, however, are still yet to release the vouchers with their third bill payment. Eligible customers. These are people who have now successfully paid their third bill payment, and this shows the total now owed to you. No longer eligible. These are people who did have a policy but sadly cancelled it before they reached their third bill payment. We show you this to make it transparent should your ‘Upcoming’ number go down. That’s everything you need to know about making the most of the Dinghy referrals scheme to help boost your finances a little. If you do have any questions, be sure to check out our referrals FAQs and if you do have any comments or suggestions, be sure to let us know either in the comments below or get in touch via the chat widget on this page. *Amazon.co.uk is not a sponsor of this promotion. Amazon.co.uk Gift Cards (“GCs”) may be redeemed on the Amazon.co.uk website towards the purchase of eligible products available on Amazon.co.uk. GCs cannot be reloaded, resold, transferred for value, redeemed for cash or applied to any other account. Amazon.co.uk is not responsible if a GC is lost, stolen, destroyed or used without permission. See www.amazon.co.uk/gc-legal for complete terms and conditions. GCs are issued by Amazon EU S.à r.l. All Amazon ®, ™ & © are IP of Amazon.com, Inc. or its affiliates. †Neither John Lewis nor Waitrose are sponsors of this promotion. John Lewis Gift Cards (“GCs”) may be redeemed on the johnlewis.com or waitrose.com websites, John Lewis & Partners or Waitrose & Partners shops, including to purchase food and drink in our catering units (excludes third-party outlets in John Lewis & Partners shops) towards the purchase of eligible products. GCs cannot be reloaded, resold, transferred for value, redeemed for cash or applied to any other account. John Lewis & Partners or Waitrose & Partners are not responsible if a GC is lost, stolen, destroyed or used without permission. See https://www.johnlewis.com/customer-services/shopping-with-us/terms-and-conditions for complete terms and conditions.